Body hair can be harvested and utilized for scalp hair transplantation in people with hair loss who have both good course body hairs and whose scalp donor area is severely depleted. Body hair should not be regularly used as an alternative to scalp hair for hair transplants in people who have good quality hair on the back and sides of their scalp (scalp donor area). This is because body hair has a short growth cycle in comparison to scalp hair, which makes body hair less desirable than scalp hair for transplantation. Each scalp hair grows between 1 to 6 years and then goes to its resting phase for 4 to 6 weeks in which the hair follicle falls out before the start of another growth cycle and growth of another hair. Body hair on the other hand has a totally different growth cycle, which consists of a much shorter growth phase and a longer resting phase. In other words, many body hair follicles that you transplant stay in their resting phase most of their lives and only a fraction of them grow and could be seen at any given period of time. This means you are transplanting hair follicles knowing that not many of the hairs themselves could be seen at any given period of time. Body hair transplants are okay to use for people who have no alternative i.e. bad donor hair density, unfavorable hair quality or tight donor areas with significant scarring that makes hair difficult to obtain. 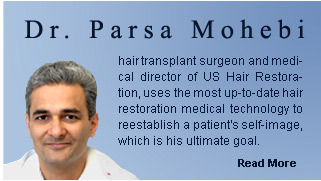 The Parsa Mohebi Hair Restoration offers body hair transplants to some patients after thorough evaluations of their donor and recipient areas for determining their candidacy for this procedure.